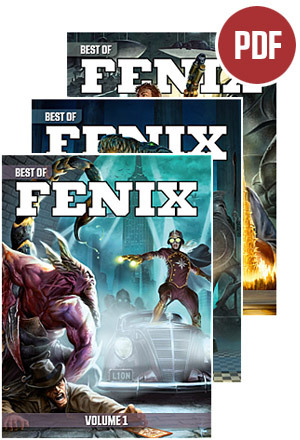 Buy all three volumes of Best of Fenix to a considerably better price. Why choose one when you can have them all? The Lion in Fimbulwinter - Kenneh Hite on Sweden in The Day After Raganrok. The House That Jack Built – Martin Brodén Rother-Schirren incorporates Jack the Ripper with the Golden Dawn in a campaign setting where the Whitechapel murders are the starting point to an occult/horror campaign where almost anything can be added. The Last Flight of KG 200 – Kenneth Kenneth Hite’s horror storytelling game presents a desperate crew, flying out of the heart of darkness, into the heart of mystery. It might kill them all, or worse: reveal the truth they fly from. Golem - Åsa Roos on the legend of Golem and how it can be used in play. 51 Mythos Dooms – Since almost any Mythos entity might trigger the apocalypse, this column from Kenneth Hite offers a choice of dooms, one for every entry in the Trail of Cthulhu core rulebook. The Tree of Life Eternal - Pete Nash has written a long and inspiring grim and dark scenario to RuneQuest 6. More than Zombies – Åsa Roos on voodoo and how to incorporate it into your roleplaying campaign, and how to adjust it for different settings. The article includes two scenario seeds. Lovecraftian Horror - H. P. Lovecraft is as huge in the roleplaying community as he is unknown outside of it. Why? Martin Brodén Rother-Schirren takes a closer look at the man and his methods in search of an explanation. The Many Faces of Horror – Pete Nash on three main methods of supporting horror tropes using the core rules of RuneQuest 6. In addition he introduces the horrifying monsters The Vengeful Ones, to be inserted into any fantasy or sci-fi-setting. The Demons of Memory – Kenneth Hite on the demons affecting our memories and the hard to remember Nefastis Institute. Hite also shares his thoughts on how to use the material in different games and settings. Celestial Storm – A Crusade for Fallen Gods – A freeform fantasy game for 3-5 players. Nils Hintze has written this a drama of galloping horses faster than the wind, duels with curved blades, dramatic poetry, cunning djinns and hopelessness. Fictive Games in Fictive Worlds - Christoffer Krämer on why it is worth your while to create a fictive game to be played by the characters in your fictive world – and how to avoid the pitfalls in doing so. Just Add Rum - Kenneth Hite provide you with everything you need in order to create pirates for your own campaign that makes sense, adding flavor and excitement to the rest of your world in the process. Better Angels – A complete humoristic Cardgame – Game Developer Christoffer Krämer, probably best known on the international scene for Gigantoskop's games Big Badaboom, Badaboom and Kablamo, has developed this card game for Fenix readers. In the books you will find a separate insert with the game props printed on thicker paper. Steampunk and space travel are two main ingredients in this volume. Below you will find the material our crowdfunders helped to include – but you will find some bonus material in this volume as well.